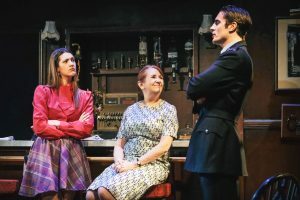 HEARTBEAT has gone from a Sunday evening TV staple to a stage show – and fans are now nostalgic for… nostalgia, according to original star David Lonsdale. The long-running TV police series was built on memories of fashion, cars and music from the 1960s, but he says: “Now, what people are saying to us is that it makes them feel nostalgic, not just for the ’60s, but for the times they sat down with their family on a Sunday evening to watch. David plays his original character, the lovable ‘village idiot’ David Stockwell, in the theatre tour, while Steven Blakeley, also from the original TV cast, plays PC Geoff Younger. Carly Cook takes on the role of barmaid Gina, David Horne plays Bernie and soap fans’ favourite, Hollyoaks’ Matt Milburn, plays PC Joe Malton. David says one of the reasons for the lack of original actors is because the TV show was so great to work on, no-one ever left and they’re now too old to do a UK tour! “I did it for 15 years nearly full-time,” he explains. “Nobody goes into acting expecting a full-time job but it’s what I ended up with. “A lot of the actors enjoyed it so much they stayed with it, but now they’re too old to do a theatre tour. Half the original cast is over 70, which came as quite a shock. The storyline is new but David adds that it will be familiar to theatre-goers. He said: “We did over 350 of the TV series so a lot of stories were used up. As ever it’s a mixture of a dramatic storyline with comedy sub-plots. There is also lots of music, of course; each of our scenery changes are accompanied by nostalgic songs in the same way it was on the TV. Heartbeat will be at Woking’s New Victoria Theatre from Monday (30 May) until Saturday 4 June.